In 2013 Mayra Orchestra released the beautiful debut album World Of Wonder. When I first heard it, I thought that it was an American band. When I read the biography, I was astonished. Mayra Orchestra was a Dutch neo progressive rock band who was led by Maartje Dekker. The album was received mostly positive and the band even did some gigs. At the gigs Mayra Orchestra was really an orchestra and not a band. The band was completed with additional musicians. This created a great atmosphere. Together with theatrical elements, the atmosphere was even greater. Four years after the debut, Oracle was released. When you take a look at the album, there are two things that draw my attention. The album artwork is fabulous and the additional musicians are band members now. The artwork is done by Maartje Dekker, who else. What a creative mind she has. The influence of the additional musicians is evident. In the next part of this review I will comment more about this influence. Most readers like to know what style a reviewed band has and with which bands it is to compare. 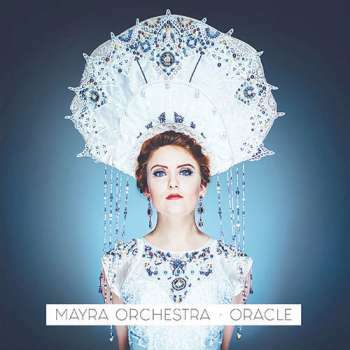 Mayra Orchestra describes there music as “new cinematic pop orchestra”. Further on they compare their style with Hooverphonic, Ane Brun or Tori Amos. I know all these artist well and I can only confirm this. Oracle is a real journey through different music style. They all have in common the character of styles that are modest and have “spacy” atmospheres which makes the music really exciting. The vocals of Maartje Dekker are flawless, pure and touching. Personally I think it's Anneke van Giersbergen (ex-The Gathering) without the sharp edges and without the overdriven vocal parts. The lineup of Mayra Orchestra is: Maartje Dekker (vocals, piano), Christiaan Bruin (drums, guitar, percussion), Tim Van Gelder (bass guitar), Rik van Honk (trumpet, accordion), Miranda Janse (harp), Ruben van Kruistum (cello), Tom Luchies (guitar), William McNeill (horn), Sophie Reekers (vocals), Christopher Rennebach (trombone), Annelies Rijk (violin), Jacobus Thiele (percussion), Mario Torres (double bass) and Intan Werry (violin). Is it possible to record an album in an open way, so that all instruments complete each other instead of making some sort of mess? The answer is: yes! Christiaan Bruin produced the album and it sounds epic. Please take a look at YouTube. You'll find there a couple of live tracks on which the high standards of Mayra Orchestra is made clear. Oracle is an album with beautiful dark atmospheres. The album sounds melancholic and even frightening in some parts. Due to the clear recordings all instruments are sounding bright. Even tiny accents are sounding fabulous. Mayra Orchestra have done a great job and delivered an even better album than the debut album. The music has developed into more mature song structures. That's what I call progressive. Therefor I reward this album with a 4+. The 5 star rewarding I save for their next album! Oracle is highly recommended. Once more a Dutch progressive rock band to be proud of.